San Luis Obispo County, CA — Terrifying video of an in-custody death has recently been released confirming police officers tortured a man for days in a restraint chair and then laughed as he spent his final moments alive suffering in agony in his jail cell. The footage, obtained by the San Luis Obispo Tribune, not only shows the graphic death of Andrew Holland in January 2017 but it also proves cops told the public a story that did not happen. Holland was pronounced dead in his jail cell on Jan 22, 2017, only one hour after he was released from spending nearly two entire days strapped in a restraint chair. The Tribune received more than 100 hours of footage from the jail showing the horrific abuse Holland endured prior to his death. Holland, 36, was a diagnosed schizophrenic who spent much of his adult life in and out of jail for minor offenses related to his mental illness. Prior to his death, he’d been locked up for resisting arrest. He spent most of this time locked in isolation in a tiny cell barely big enough for a twin mattress and a toilet. During Holland’s last moments alive, deputies can be seen laughing at multiple points during the video. According to the county medical examiner, Holland died of “natural” causes due to a pulmonary embolism, when a blood clot traveled from his leg to his lungs. However, being tied to a chair for nearly two entire days creates the potential for blood clots to form, which can be fatal. It is for this reason that official policy requires officers to regularly rotate an inmate’s extremities to prevent clotting. 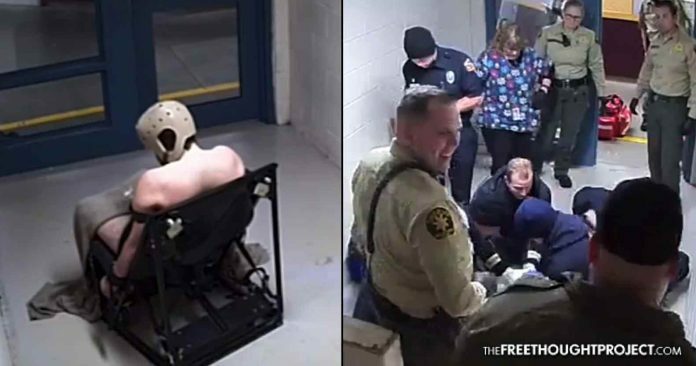 Disturbingly enough, although officers were seen moving his arms and legs, Holland was never allowed to stand up—even to use the bathroom—for 46 hours as he remained strapped in the chair. These alleged ‘changes’ cannot happen fast enough. The San Luis Obispo County Jail has been responsible for a dozen in-custody deaths in just the last six years—which is three times the national average. Exactly what this ‘change’ will consist of remains unclear as well. While the taxpayers of San Luis Obispo County have paid for the death of Andrew Holland—to the tune of $ 5 million—none of the officers seen in the disturbing footage below has received so much as a slap on the wrist.